What comes up first to your mind when you think of Cape Town? The beautiful Mother City has much to offer for wheelchair users. Table Mountain, breathtaking landscapes, surfers, African penguins, whales, baboons and so much more! Wheelchair-accessible Cape Town is a perfect destination to escape the European winter. During our three holidays at the magical Western Cape, I discovered lots of incredible and accessible spots I’d like to share with you! 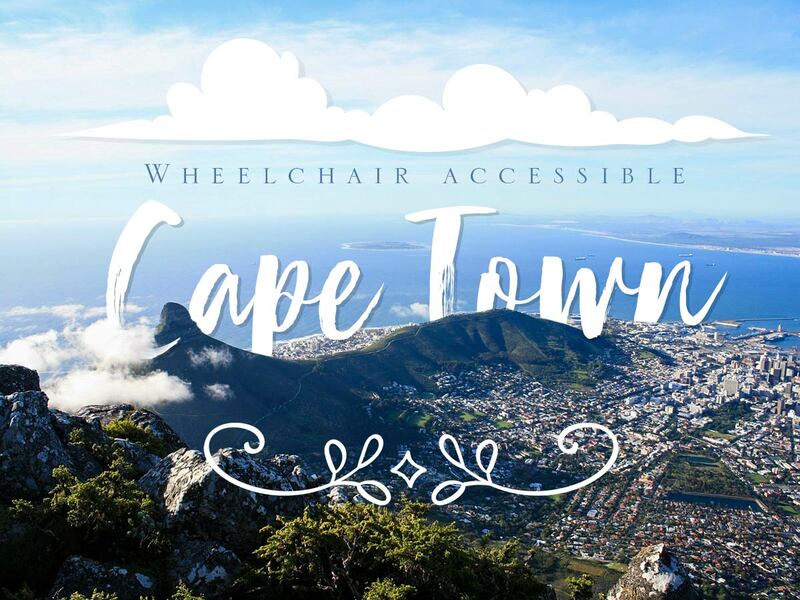 Cape Town and the surrounding areas are pretty wheelchair accessible. Almost all major tourist attractions provide good service for wheelchair users. And most importantly (at least for me), I always found wheelchair accessible restrooms. There surely are things to improve, like high pavements or a few missing curb drops. But the city of Cape Town is continuously working to improve its wheelchair accessibility. Taking the accessible Citysightseeing Tour Bus is a great way to see Cape Town’s major sights. We stayed at the Tuscan Villa Guesthouse in Fish Hoek. Boulders Beach with its African penguins as well as the Cape of Good Hope, Muizenberg, and other famous spots are closeby. So, therefore, Fish Hoek was a perfect “home base” for us. The Boulders Room is completely wheelchair accessible. There is enough space for a wheelchair user and the spacious bathroom is just perfect with its roll-in shower. The height adjustable beds are also a nice feature. Anita and Jeremy Rice were very friendly, helpful and caring hosts. And the breakfast buffet was a dream: freshly prepared fruit salad, delicious pastries, cereals, porridge, toast, cheese, yogurt, and a cooked English breakfast. Tell me about our experience by leaving a comment below or send a message! Que dire ? si ce n’est que cela va donner l’eau à la bouche à pas mal de gens d’aller faire un tour dans ces endroits merveilleux et pratiques que tu décris si bien avec tes très belles photos à l’appui. Je te verrais bien avec ta propre agence de voyage. Tu ferais un tabac tellement tu sais bien communiquer tes impressions et ton enthousiasme ! Bravo Mélie pour ta générosité à nous transmettre ta joie au travers de cette aventure sans bavure. Das sind traumhafte Fotos von deinem Urlaub. Ich wünschte du hättest noch länger bleiben können, ich hätte es dir auf jeden Fall gegönnt. Das schönste Foto ist nicht irgendeine Landschaft oder eure Zimmer, sondern das Foto in dem du stehst. So hab ich dich damals kennengelernt und noch heute in Erinnerung. Cape Town seems best, The Table Mountain is worth a visit, and I love the fact that it has wheelchair facilities too. I would love to take my son there.